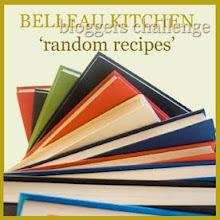 It's Random Recipe time again and this month Dom at Belleau Kitchen has challenged us as follows: "refer to your birthday date as the number you should use to randomly pick your book... for example, my birthday is the 24th September and so I have randomly chosen the 24th book on my bookshelf counting from right to left... it doesn't really get more tenuous or random than this does it but it's nice to have a little theming every month don't you think?" 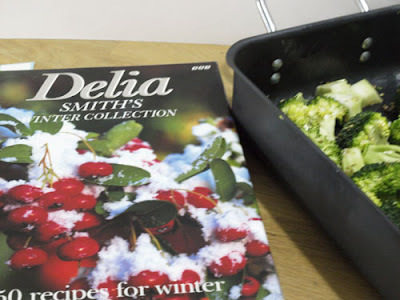 I'm not giving anything away about my birthday, you'll just have to believe me when I tell you that I followed the instructions and, while Dom picked out Nigella, I got Delia! Isn't it interesting that these two iconic women cooks are known by their first names. You would never just refer to Nigel (Slater) or Hugh (Fearnley-Whittingstall), maybe Jamie comes close but he is still Jamie Oliver, anyway I digress, on with the challenge. It was the Winter Collection which came up as my Random Recipe book, which was helpful, it being winter! I opened the book randomly as instructed and had a choice of Sauteed Carmelised Fennel or Oven Roasted Cauliflower an Broccoli with Garlic and Coriander, I didn't have any Fennel or Cauliflower, but I did have a head of Broccoli. I can't say I was terribly impressed by this recipe. 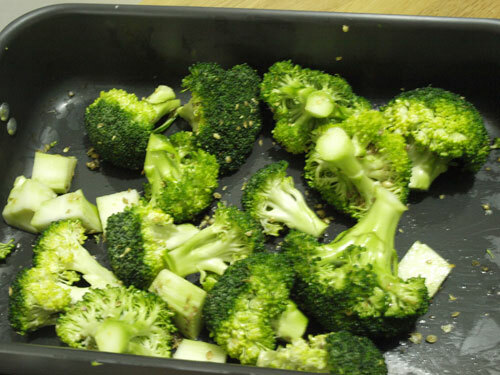 The coriander and garlic flavour was really good, but the broccoli was still a bit too hard, if I'd left it in the oven any longer it would have burnt. 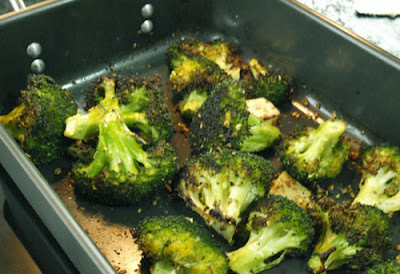 I think if I made it again I would blanch the broccoli for a few minutes before roasting. I served the broccoli with a homemade turkey and ham pie. NOT really a recipe that I would associate with Saint Delia, and not a way I would cook broccoli, but, good on you for giving it a go Janice! Do you know, though, roasted cauliflower is a glorious thing. I'm a recent convert, and I would struggle to cook it any other way now. 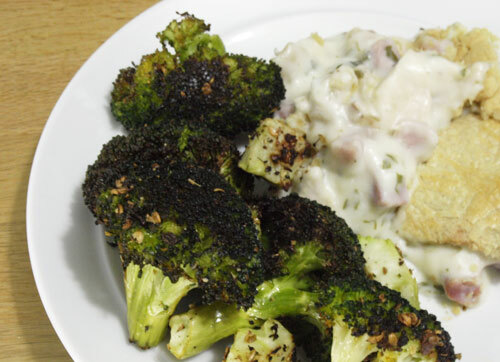 If you blanch the broccoli first, it is a big help in stopping it burning - I've had similar problems before! And the taste of charred vs roasted broccolis is quite different! On the plus side, at least it wasn't a disappointing cake - they're always the worst as the expectations are so much higher! I've made this recipe a number of times and I confess that I've always thought it was pretty horrible. My wife loves it, though, and I cook what I'm told to cook.